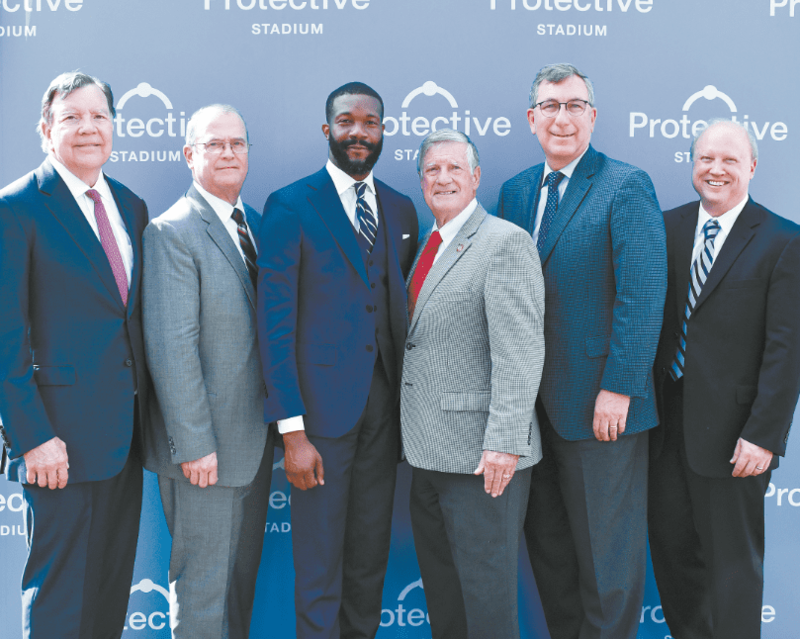 From left: Protective Life Executive Chairman Johnny Johns; BJCC Board of Directors President Dennis Lathem; Birmingham Mayor Randall Woodfin; Jefferson County Commission President Jimmie Stephens, Protective Life President and CEO Rich Bielen; and BJCC Executive Director Tad Snider. Journal photo by Jordan Wald. Protective will pay $1 million a year for the next 15 years in exchange for the 55,000-seat stadium being named Protective Stadium. The announcement was made at a ceremonial groundbreaking at the BJCC on April 13. Construction is scheduled to begin in early fall. “The city, county, BJCC, UAB and the business community have all come together to form a collaborative coalition, and that teamwork has been instrumental in pushing this project forward. The fulfillment of this dream confirms that truly amazing things can happen in this community when we focus our energies on coming together,” said Johnny Johns, Protective Life Executive Chairman during the ceremonies at Uptown Park last week. Other big contributors to the project are Regions Financial Corp. and Alabama Power, which are each paying $500,000 per year for the next 10 years, in addition to primary funding from the city of Birmingham, Jefferson County and UAB.